I don’t have a whole lot of extra time to experiment with fancy dinner recipes these days. Most nights I am not even free to start working on dinner until Jeremy comes home to entertain the kids at 5:30 or 6pm, so I tend to keep things pretty simple, and most of our side dishes are roasted, mashed or sautéed vegetables. A few nights ago, the dinner plan was just chicken-apple sausages browned up in the cast iron skillet, so I decided to make our side a little more interesting and found a recipe for grain-free sweet potato gnocchi. These gnocchi actually didn’t take all that long to make, and would have been even faster if I had had leftover roasted or mashed sweet potatoes to start with. Better yet, one large sweet potato yielded enough gnocchi for 3 dinner servings and a whole sheet tray to freeze for a quick fix later on. I was a little concerned about the texture becoming gummy from the arrowroot, and they did tend that way a little bit, but nothing that pan-frying in grassfed butter couldn’t fix! Perhaps next time I will use a higher proportion of almond flour to arrowroot and see if that helps. To freeze these for later, just place the uncooked gnocchi on a sheet tray lined with parchment or a silpat (make sure to keep them separate for easier portioning) and throw them in the freezer. They can be boiled without thawing when you want a quick meal. Add each of your flours in 1/2 cup portions, stirring well between each addition. After you have a whole cup of each flour added in, stir in the salt and baking soda, followed by the egg white. Resume adding flours half a cup at a time until you reach a dough consistency that you are able to roll into a ball without too much sticking. You may need a little more or a little less than what is called for, depending on the moisture in your sweet potatoes and the air. 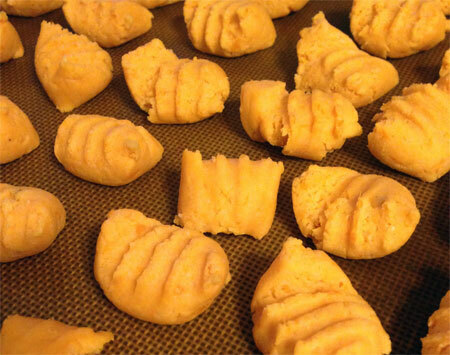 Take a handful of dough and roll it out into a long snake shape with your hands, about an inch in diameter. If it sticks to your hands or the countertop, dust with some of the arrowroot powder. Cut the snakes into segments about half an inch each. You can leave them in that shape or groove them like traditional gnocchi by rolling them off a fork using gentle pressure with your thumb. Once all of your dough has been shaped and cut, drop a batch into a pot of boiling salted water; don’t crowd the pot too much! Within about a minute, they will float to the surface. Let them continue cooking for about 30 seconds after they float to the top and them remove them to a colander with a slotted spoon. I highly recommend frying the boiled gnocchi in plenty of grassfed butter, lard, or coconut oil with a pinch of salt. Let them brown well before flipping them over, because they can be sticky and we liked them much better with a good crust. Remove to a serving plate and top with the sauce of your choice. I let the flavor of the sweet potato shine through on ours (and saved myself some time) by just throwing some frozen peas in the skillet with the frying gnocchi. However, sage and brown butter with shavings of Parmesan would be lovely, or perhaps something with ginger and a hint of sweet and sour, like a brown sugar-sherry gastrique; they would also hold up well with marinara or pesto. 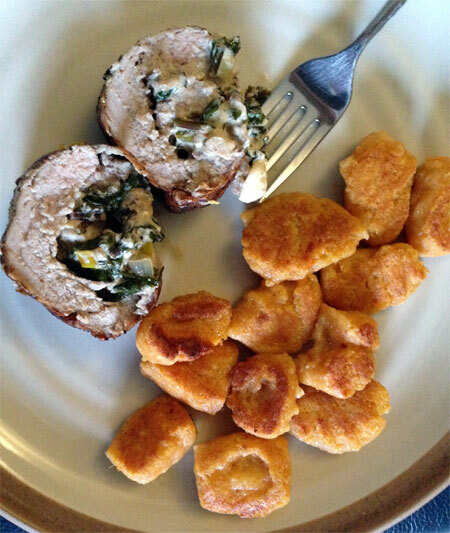 Update 4/5/14: Dinner was a pork tenderloin roulade, stuffed with shiitakes, leeks, dandelion greens, and cream cheese. I served it alongside some sweet potato gnocchi from the freezer; the gnocchi took just a minute or two longer in the cooking water, and held their shape perfectly for frying up in butter.